10 • July 2018 • S I G N & D I G I T A L G R A P H I C S Monthly News Roundup B Y T O N Y K I N D E L S P I R E J U L Y 2 0 1 8 Get the latest industry news from Tony Kindelspire five days a week by signing up for our eNewsletter at sdgmag. com. Look for the red "Get the eNewsletter" button on the home page. Have industry news to submit? Contact Tony at tkindelspire@ nbm.com. 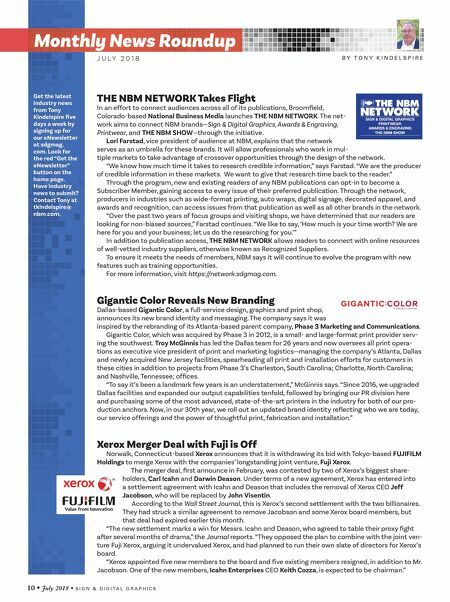 THE NBM NETWORK Takes Flight In an effort to connect audiences across all of its publications, Broomfield, Colorado-based National Business Media launches THE NBM NETWORK. The net- work aims to connect NBM brands—Sign & Digital Graphics, Awards & Engraving, Printwear, and THE NBM SHOW—through the initiative. Lori Farstad, vice president of audience at NBM, explains that the network serves as an umbrella for these brands. It will allow professionals who work in mul- tiple markets to take advantage of crossover opportunities through the design of the network. "We know how much time it takes to research credible information," says Farstad. "We are the producer of credible information in these markets. We want to give that research time back to the reader." Through the program, new and existing readers of any NBM publications can opt-in to become a Subscriber Member, gaining access to every issue of their preferred publication. Through the network, producers in industries such as wide-format printing, auto wraps, digital signage, decorated apparel, and awards and recognition, can access issues from that publication as well as all other brands in the network. "Over the past two years of focus groups and visiting shops, we have determined that our readers are looking for non-biased sources," Farstad continues. "We like to say, 'How much is your time worth? We are here for you and your business; let us do the researching for you.'" In addition to publication access, THE NBM NETWORK allows readers to connect with online resources of well-vetted industry suppliers, otherwise known as Recognized Suppliers. To ensure it meets the needs of members, NBM says it will continue to evolve the program with new features such as training opportunities. For more information, visit https://network.sdgmag.com. Gigantic Color Reveals New Branding Dallas-based Gigantic Color, a full-service design, graphics and print shop, announces its new brand identity and messaging. The company says it was inspired by the rebranding of its Atlanta-based parent company, Phase 3 Marketing and Communications. 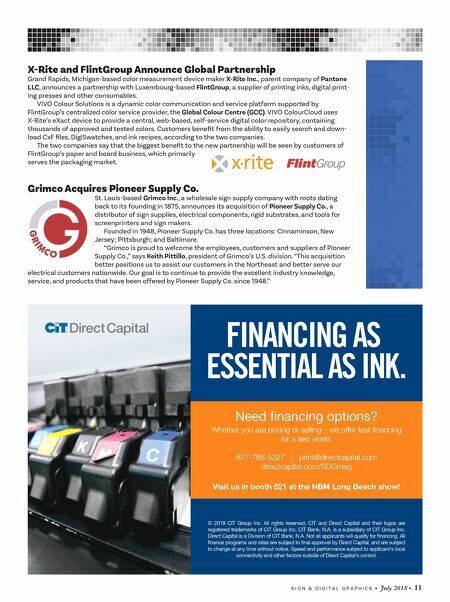 Gigantic Color, which was acquired by Phase 3 in 2012, is a small- and large-format print provider serv- ing the southwest. Troy McGinnis has led the Dallas team for 26 years and now oversees all print opera- tions as executive vice president of print and marketing logistics—managing the company's Atlanta, Dallas and newly acquired New Jersey facilities, spearheading all print and installation efforts for customers in these cities in addition to projects from Phase 3's Charleston, South Carolina; Charlotte, North Carolina; and Nashville, Tennessee; offices. "To say it's been a landmark few years is an understatement," McGinnis says. "Since 2016, we upgraded Dallas facilities and expanded our output capabilities tenfold, followed by bringing our PR division here and purchasing some of the most advanced, state-of-the-art printers in the industry for both of our pro- duction anchors. Now, in our 30th year, we roll out an updated brand identity reflecting who we are today, our service offerings and the power of thoughtful print, fabrication and installation." Xerox Merger Deal with Fuji is Off Norwalk, Connecticut-based Xerox announces that it is withdrawing its bid with Tokyo-based FUJIFILM Holdings to merge Xerox with the companies' longstanding joint venture, Fuji Xerox. The merger deal, first announce in February, was contested by two of Xerox's biggest share- holders, Carl Icahn and Darwin Deason. Under terms of a new agreement, Xerox has entered into a settlement agreement with Icahn and Deason that includes the removal of Xerox CEO Jeff Jacobson, who will be replaced by John Visentin. According to the Wall Street Journal, this is Xerox's second settlement with the two billionaires. They had struck a similar agreement to remove Jacobson and some Xerox board members, but that deal had expired earlier this month. "The new settlement marks a win for Messrs. Icahn and Deason, who agreed to table their proxy fight after several months of drama," the Journal reports. "They opposed the plan to combine with the joint ven- ture Fuji Xerox, arguing it undervalued Xerox, and had planned to run their own slate of directors for Xerox's board. "Xerox appointed five new members to the board and five existing members resigned, in addition to Mr. Jacobson. One of the new members, Icahn Enterprises CEO Keith Cozza, is expected to be chairman."